The 2019 VE Social Venture Challenge is a business pitch competition designed to inspire VE students to propose solutions to pressing social and environmental issues. This year’s competition prizes will be supported by BNP Paribas, whose mission supports igniting social innovation for the common good. The purpose of the 2019 VE Social Venture Challenge is to give VE students the opportunity to develop a real business concept that has a social and/or environmental impact. 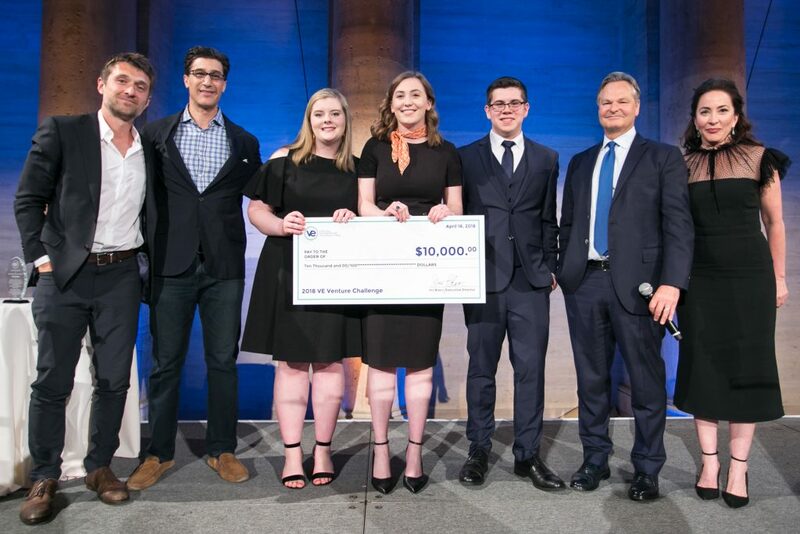 Student teams of 2-4 members who advance to the final round will be able to pitch their unique social enterprise business concept to a panel of leading entrepreneurs and BNP Paribas executives – at VE’s annual gala on April 17, 2019 in New York City. Budding entrepreneurs will be able to transform their concepts into viable businesses that drive social change through mentorship, education, financial support and real-world business opportunities. A $10,000 monetary prize will be awarded to the first-place team to advance their concept and a laptop computer will be awarded to each second- and third-place team member. The 2019 VE Social Venture Challenge Interest Application is now closed. What should you consider before submitting an idea? What is the challenge are you trying to solve? How do you intend to solve this challenge? What is your vision for the future beyond solving the immediate challenge? …must solve a social and/or environmental issue and be entirely integrated into your social venture business model. …should not be limited to simply donating a portion of its profits to charity; it must have a positive impact on a social issue or the environment. …needs to have the potential to scale. …should be able to build a viable economic model and not rely only on grants or outside donations. …should be able to identify potential partners that you could approach, potential competitors, and potential funders. Research whether or not your social enterprise business already exists. However, you may submit an idea that improves upon an existing product and/or service. Conduct a Google search to see if your idea exists. Search the United States Patent and Trademark Office’s database to see if your product idea has been submitted for a patent. Can the VE Social Venture Challenge Mirror the VE business? YES, as long as the social enterprise business addresses a sustainability challenge and is a viable concept that can be implemented in the real world. Is this competition in lieu of the VE Business Plan Competition? NO. This competition will be a separate competition with different judging criteria, submission timelines, and team members. VE Social Venture Challenge semi-finalist teams must be willing to commit to mentoring by industry professionals leading up to the Challenge via Skype. October 1, 2018 – November 20, 2018 – Team and business concept application period. November 20, 2018 – December 22, 2018 – Round 1 application period. January 19, 2019 – Seven (7) semi-finalist teams will be selected to advance to Round 2. February 8, 2019 – Semi-finalist submit Round 2 application by 5:00 PM. February 15, 2019 – Three (3) finalist teams will be selected to advance to the Final Round. Mentors will be assigned. Finalist teams must commit to work with mentors (through Skype) to refine their presentation leading up to the Challenge. February – April 2019 – Teams will practice their pitch presentations with VEI staff and business mentors. April 17, 2019 – Three (3) finalist teams will give their pitch presentations at the Gala. Teams of 2-4 students may apply to enter the Challenge. The designated team leader must complete the online application found below (application pending). The application consists of relevant business questions and a one-minute Video Pitch, which must be submitted by 5:00 PM, Friday, December 22, 2018. Round 1 entries will be evaluated by VEI staff, who will provide feedback and might ask for clarifying questions. All entries will be kept confidential. After VEI staff review Round 1 submissions, seven (7) semi-finalist teams will be selected to advance to Round 2 and will be notified by January 19, 2019. The 60-second video pitch should include the following information. The problem that the product/service is trying to solve. How the product/service is going to solve the problem. A description of the potential customers. Why the product/service is better than those of the competition. Why their team is the best to lead the company to success. The seven (7) semi-finalist teams will be asked to provide more detail about their business idea by February 8, 2019. Three (3) finalist teams will be selected to advance to the Final Round and will be notified by February 15, 2019. Mentors will be assigned. Finalist teams must commit to work with mentors (through Skype) to refine their presentation leading up to the Challenge. 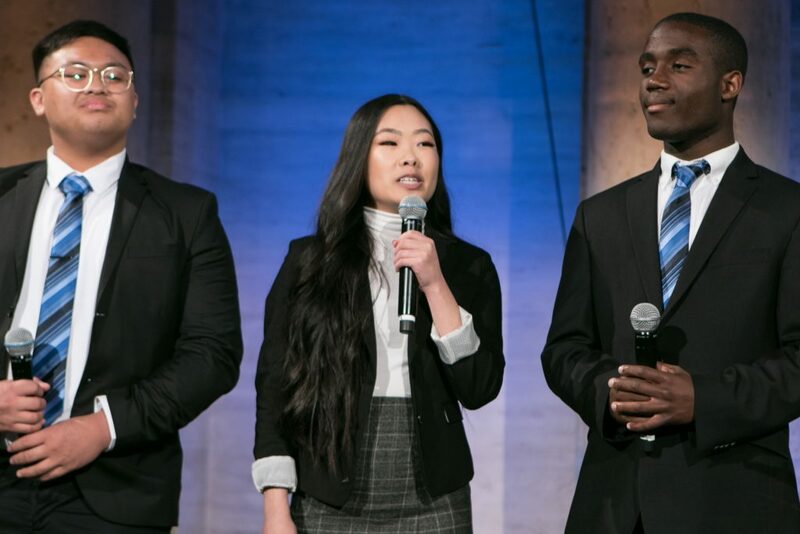 The three (3) finalist teams will be invited to give their pitch presentations at the Gala on April 17, 2019 in New York City. Distributing material, samples and/or prototypes is permitted and encouraged. PowerPoint slides (up to 4 slides) or audio/ video assistance is allowed. Each presenter will be given a few minutes to answer questions from the judges. The presentation pitch may not exceed 3 minutes. Finalist teams will be eligible to win prize money (to advance their concept), and each team member will receive a laptop computer. Transportation and lodging costs to New York City will be provided to finalist teams not taking part in the YBS. Judges for each round will evaluate the teams as real-world entrepreneurs soliciting start-up funds from investors. The businesses will be judged on the following criteria: viability, scalability (growth potential), team, innovation, and pitching skills. Businesses will be ranked based on which company the judges would most likely invest in as a sustainable social enterprise. Thank you and good luck to all participants! BNP Paribas is a leading bank in Europe with an international reach. It has a presence in 73 countries, with more than 196,000 employees. The Group helps all its clients (individuals, community associations, entrepreneurs, SMEs, corporate and institutional clients) to realize their projects through solutions spanning financing, investment, savings and protection insurance. As a global company and Bank, BNP Paribas has a key role to play in building a sustainable future and therefore place great importance on its responsibility towards the economy, its employees, the environment and the communities. Madeline B. and Skyler S. from Parkway South High School in Missouri won the 2018 VE Venture Challenge, securing $10,000 in seed funding as well as a 1-year membership at WeWork Labs as they work to launch Generation, the ultimate unisex outdoor jacket.